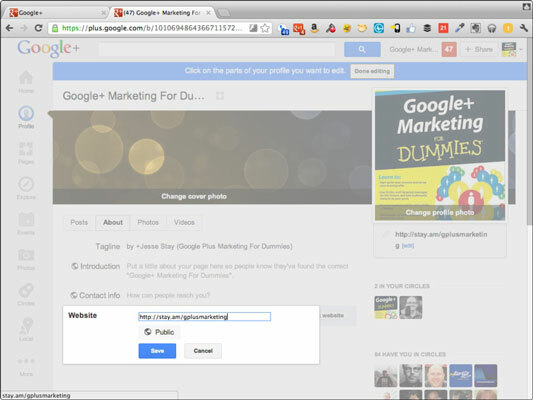 How to Integrate your Website Into your Google+ Page. 1. Click your name in the Google bar at the top of Google+, select your Google+ Page, and click the About tab to get to your page’s profile.The Profile section of your Google+ Page opens. 3. Click the Link website button. 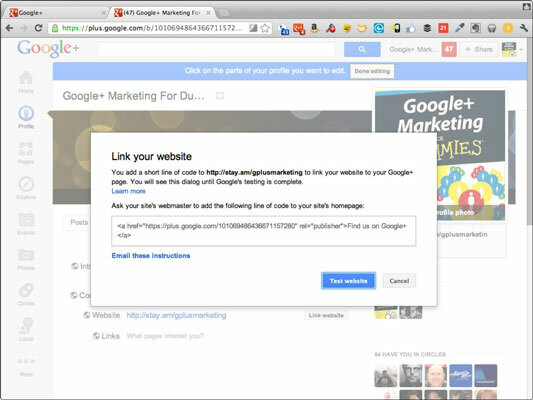 A pop-up window shows you the code you need to copy into your website (the same code shown in the next step)so that the site displays a link to your Google+ Page. If you don’t want your users to see the text link to your Google+ Page on your website, refer to the next step.Otherwise you’re done. Be sure you replace YOUR_URL_HERE with the URL of your Google+ Page. If you’re keeping the text of this link onscreen for your users to see on your website (recommended), you can also replace the Find us on Google+ text with a more enticing message specific to your brand. 1. Make sure you can still identify your website with Google. 2.Put the line somewhere in the <head> section of your HTML. Now the link exists. Your users will never see this, but Google+ will, and it should start recognizing the link.